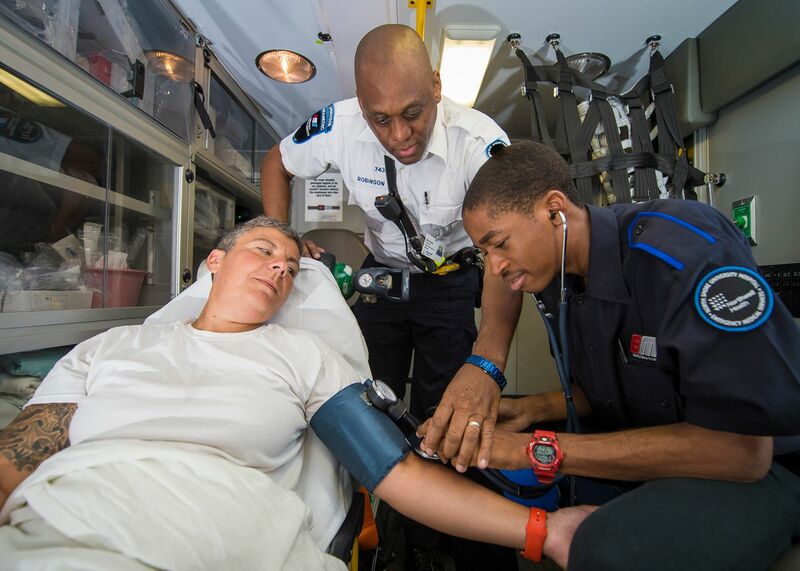 Bernard Robinson overlooks the care a patient receives in an ambulance. Working in emergency medical services requires skill, intelligence and empathy. It is one of the most stressful yet popular and rewarding professions. In fact, the US Bureau of Labor Statistics projects EMTs and paramedics to grow 15 percent within the next decade. Providing care in one of the country’s most densely populated areas, Northwell Health has redefined emergency medical services (EMS) by offering community parademics and utilizing smart routing tools and additional technologies that can send patient information to the emergency department prior to arrival. While technology has improved and streamlined emergency care, here are the five essential skills needed for all paramedics and emergency medical technicians (EMTs). Working as a team is necessary on every EMS call. There are often multiple agencies on scene. Whether it’s police, fire or another EMS agency, we must always coordinate efforts and work toward achieving the best outcome for the patient. As a paramedic or EMT, there will be times when everyone on the scene is looking to you to solve the problem. Whether someone needs to be intubated, their airway controlled or a hypoglycemic patient needs glucose, frantic family members, fellow first responders and bystanders with their cellphones will be watching and possibly live streaming your every action. It is important to remain calm and stay professional. All eyes are on you. In the world of EMS, there is rarely the “textbook scenario.” Many times we may have to be creative to figure out the best resolution to help a patient. During an emergency call, we are tasked with extricating patients from a scene, as well as treating their medical condition. Often, lifesaving skills such as CPR, intubation and intravenous therapy are performed in cramped spaces such as bathrooms, underneath motor vehicles or in abandoned buildings. We must deal with the underlying medical issue and figure out the best way to remove a patient. Many times, the unconventional option may be the best. An EMT or paramedic will need an iron stomach, as he or she will encounter situations that can be gruesome. As first responders, we deal with the worst situations in a person’s life at any given time. Crime scenes and mass casualty incidents occur more often than you think. I have witnessed people quit and walk away from EMS after their first shift on the job. Be book smart and street smart. Working in EMS, you are often in an uncontrolled environment. Safety is paramount. One of the best skills that a paramedic or EMT can have is common sense or “street smarts.” If something doesn’t seem right, back off and reevaluate. We must always be alert to our surroundings while prepared to address the situation at hand. 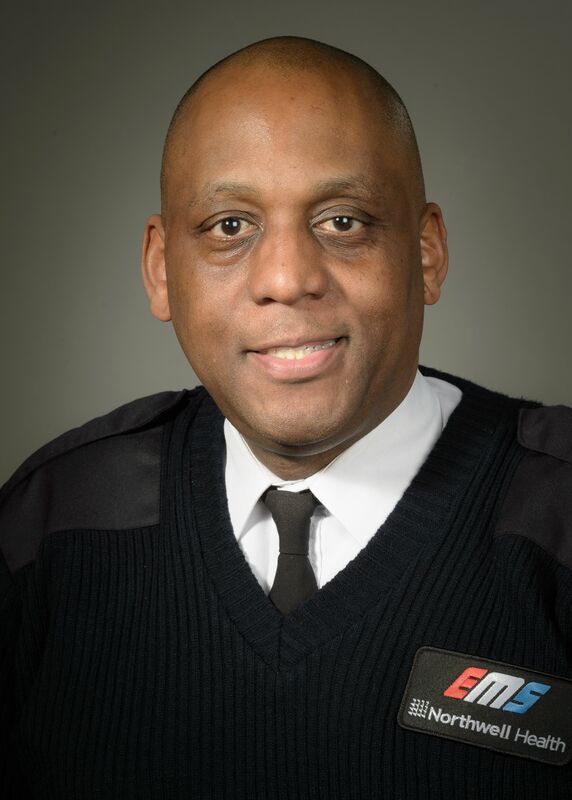 Bernard Robinson, CCEMT-P, is an operations manager of the Center for Emergency Medical Services, overseeing the daily operation of one of the largest EMS agencies on the East Coast. An EMS professional for 27 years, Mr. Robinson serves on the Northwell's Opioid Management Steering Committee and is director of the CEMS Explorers program.